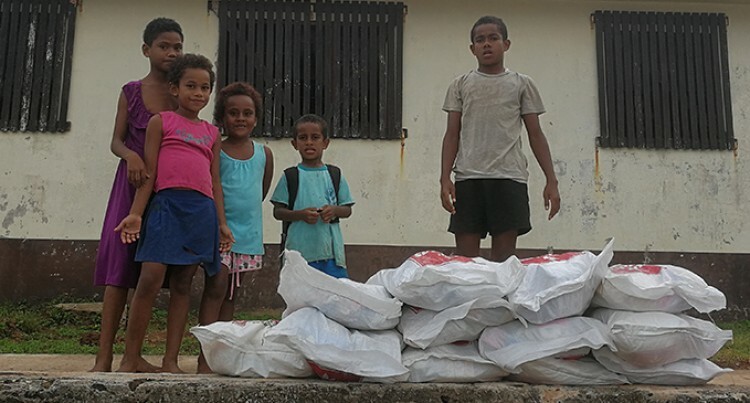 Children with food ration at Kavala Village in Kadavu on April 21, 2018. Photo: Arieta Vakasukawaqa. The Roko Tui Kadavu Kitione Raibevu says that efforts to deliver food ration packs to all 75 villages affected by Tropical Cyclone Keni have been successful. Close to 3000 food ration packs were delivered on Wednesday by a Government delegation which was led by the Minister for Waterways Mahendra Reddy. Mr Raibevu thanked Provincial Administrator Lau Eliki Masa and Provincial Administrator Ropate Rakadi for overseeing operations and making sure that all villages were covered despite the geographical location. He said that the island consisted of more than 2000 people who were directly or indirectly affected by the cyclone. The MV Iloilovatu and MV Sigavou were deployed with Government officials on board, including Republic of the Fiji Military Forces personnel to deliver food ration packs to all villages. “All villagers have been resilient and the way they responded was positive,’’ Mr Raibevu said. “I want to thank all military personnel for their assistance, especially their commitment in making sure that Government structures and schools, were cleared from heavy debris. He said that all evacuation centres on the island had been cleared and villagers had returned to their respective homes. Apart from villages , Mr Raibevu said that settlements were also delivered food ration packs. Kitione RaibevuMinister for Waterways Mahendra ReddyProvincial Administrator Lau Eliki MasaRoko Tui KadavuTropical Cyclone Keni.